One of my favorite bands is Stereophonics. They hail from Wales and liking them came as naturally to me as the predilection for consuming vast amounts of apples. For those who know me, that means, I really took to them right away since I've had a love affair with apples since the time I could masticate. Stereophonics is comprised of: Kelly Jones • Richard Jones • Javier Weyler • Tony Kirkham • Adam Zindani. Since I'm constantly looking for new sounds and bands, discovering Stereophonics came to me around the same time, my rock specialist friend, Liam, introduced me to yet another solid band, Modest Mouse. But that is another blog. This time it was another person with a penchant for Greek and Latin who also happened to work at a Virgin Mega Store location, who introduced me to Stereophonics' You've Got to Go There to Get Back. "We both like Socrates and modern UK films. I reckon, you will like this band, too," he said. And, in true socratic form, he divined right. Kelly Jones' pain and disillusion comes across unequivocally in this album and it proved to be a high-frequency album in my playlists. Jones' type of pain is somehow bearable and unbothersome. The relatability one feels when in the presence of his music is indeed uncanny. I find this particular album to be conducive to writing and meditation. And of course, after I tasted this album, I had to have more. Since then, I have not looked back and have followed their musical journey pretty consistently. 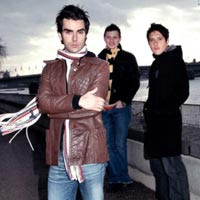 This Welsh band of musical 'brothers' is characterized by sensitive poetry, a solid bass, a consistently good drum beat, and of course, Kelly Jones' unique vocals, and in true rock fashion, dashing looks. His well-established artistic contribution to the world of music is coupled with aesthetic superiority and he delivers both form- and content-wise. For some reasom, Stereophonics have yet to reach superstardom status in the States while other British bands like Muse and Keane tend to be a crowd favorite. However, unlike other better-known British band, Stereophonics are characterized by steady discipline and fecund productivity. They have been making music for a decade and will hopefully retain their cohesion for many years to come. On thursday, the 18th of October, they are releasing their 6th studio album called Pull the Pin. Here is a list of their total albums. This is one of my favorite Stereophonics songs, "Rainbows and Pots of Gold." And this version is live. And from thein new album, Pull the Pin, "It Means Nothing"
From the new album, "It Means Nothing" is quite representative of their past mood. Also, from a previous project, give "Mr. Writer" another try. Fewer songs have been written to match Stereophonics' frustration with the critics who might not quite 'get' them. Rainbows and pots of gold: Good, good song. Dakota.... Driving like the wind down 4th south.... Dakota...... Good times, good times.